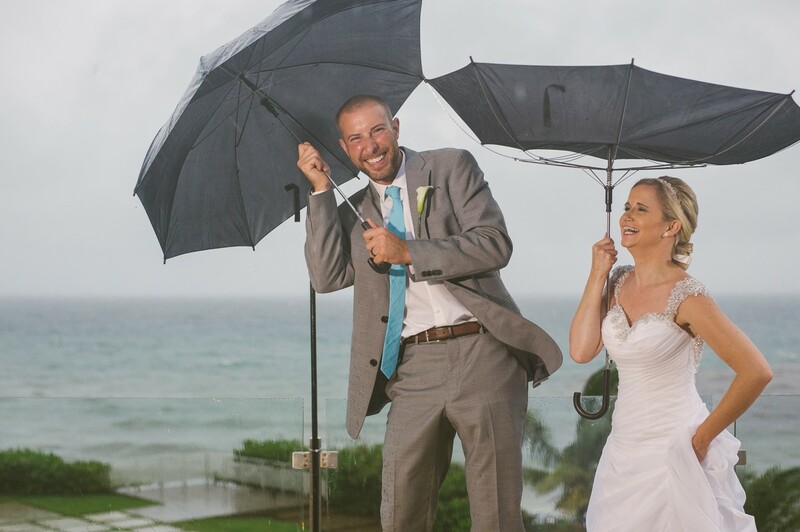 Every wedding should have a "Plan B" for inclement weather. Unless your wedding ceremony, cocktails and reception are all planned to be held entirely inside, you just can't risk not having alternative arrangements in place should Mother Nature decide to play a dirty trick on your wedding day. Even if you're all inside, you still need to be prepared with extra umbrellas and a dressing plan if it becomes not feasible to dress at home because the rain is so torrential. I know, I know... I'm talking about one of those taboo subjects you're not supposed to talk about - rain on the wedding day. But it happens. Here in the Caribbean, we often have short sprinkle showers throughout the day that don't affect the evening's activities at all, but we don't wait to see what happens. If I plan a wedding that doesn't have enough interior space to host all of the wedding events, we must have a backup plan and enough tenting to cover everybody if a three-minute torrential downpour happens. Even though it's short and sweet, soaking wet dinner tables and wedding guests make for a miserable evening. You wouldn't believe how many of my brides and grooms actually argue with me about tenting at their venues, even when I made it clear at the time they chose it that it would have be in place to cover the guests and give us something to hang the lighting on for the reception. It's something I absolutely, positively will not back down about. You hired me to plan your "dream wedding" and I can't do that if we're looking for snorkel gear for your guests at 9 pm on a Saturday night. I wish I didn't have a recent nightmare story to tell - but I do. Two of them actually. Just this past weekend. But because we had a "Plan B," everything turned out alright. I hope other brides and grooms reading this will take my words to heart and learn from my experience. Last weekend, I had two weddings back to back here on Vieques Island. We've had beautiful weather for weeks and the sudden tropical wave of rain that ambushed us midweek was incredible. We were socked in for a couple of days, but you never know how fast it will change back to sunshine the same way it can turn into rain in a blink. The most important thing for a wedding couple to remember during their wedding weekend is that as long as they continue smiling and having a good time, regardless of the weather, their family and friends will keep smiling too. And that's the moral of the two intermingled stories I'm about to tell you about two amazing couples who never stopped smiling last weekend. Hence, they both had a fabulous wedding weekend despite the weather. Jacquie and Tim from Philly got married on Friday, following two days of activities that included a beach party pig roast on Thursday. Mother Nature smiled on the bride and groom and gave them amazing weather for their beach party on Thursday - a pretty enough day for everybody to get some tan and quite a few to get pink. But the entire group had a blast and enjoyed the pig on the beach. That night, it started to rain. I never sleep well the night before a wedding if it's raining - it's just automatic for me as a wedding planner. My job is to take on the stress and worry for the bride so she can keep having fun. And to keep reminding her it's going to be all good because we have a "Plan B" if we need it. And this time we did. In almost eight years of wedding planning, I don't think I've ever been so wet for such a long period of time. Despite the torrential rain on Friday morning, we set up for the wedding (inside and outside) as though the weather would, in fact, be clear by the time of the beach ceremony planned for 4 pm. Jacquie was pretty insistent that she wanted that beach ceremony unless it was a deluge and I planned to give her that. Mother Nature was not on the same page despite my pleading emails to her. Stacy and Darwin from the Boston area were getting married on Saturday, so their rehearsal dinner/beach party picnic was on Friday during the monsoon. After setting up at Jacquie's villa, I hightailed it down to the beach for Stacy's party and the whole thing just broke my heart. When my staff is freezing and dying before the guests even arrive, it's not a good beach day. Meanwhile, I had to make a judgment call on Jacquie and Tim's wedding and by 1pm it was obvious we were going to have to move things inside their villa. Fortunately, the wedding venue was big enough to hold the entire crew for the reception activities and nobody would be sloshing around outside under a tent. Which was a good thing since it was raining sideways by the time the bride went down the aisle and we were about five miles per hour from having the little tempest declared an official Tropical Storm. I contacted all the vendors and told them to switch locations. I called in extra staffing and asked everybody to arrive at the villa as fast as they could. We had to remove every piece of furniture from the ginormous great room and hide it all inside a downstairs bedroom. The rugs got rolled up. The tables and sofas were moved. I converted the TV room into the bar and DJ station and the dining room into mission control for our team (which worked great since they were having a cheesecake buffet for wedding cake and that couldn't be displayed to the guests until after dinner anyway or it would melt). We set up the ceremony in the great room because the very large covered porch was not immune to the gusting wind and rain. The backdrop for the pictures was a huge glass window facing the water - so you can see they're in the Caribbean - it just looks like they got married during a hurricane. We nicknamed it "Hurricane Jacquie" because the bride had suffered through horrible weather for all of her pre-wedding events as well. There was a jinx on her I never figured out - she was sweet as can be and maintained a great attitude throughout. The ceremony was beautiful and everybody was dry (except our staff) and then we quickly converted the great room into the dining room while the guests mingled and enjoyed cocktails and passed appetizers. I love this picture of the bride and groom from their balcony just after the ceremony - I think the umbrellas say it all. After dinner, the tables disappeared and the dancing continued for the remainder of the reception. Some of the boys even braved the rain to go out to the bar cabana and enjoy cigars. Nobody - and I mean NOBODY - was letting rain dampen their spirits (pun intended). The bride and groom loved their wedding and thanked us profusely. We thanked them for being good sports and leading such a happy attitude for their entire group. Sure, the bride was disappointed she didn't get to exchange vows on the beach, but nobody could have seen that from the way she was behaving in front of the guests. I adore her. And the groom was a doll too and so much fun all night! It rained all night - and again, I didn't sleep. Mentally, I couldn't process having two beach weddings move to "Plan B" within 24 hours. I mean, I knew I could do it, but I didn't want to break another bride's heart. I also knew my staff was dying. Everything takes longer in the pouring rain. We have to be 100 percent more careful since all the posh multi-million dollar villas have expensively tiled floors that are like ice rinks when wet. I didn't think we even had time to dry all the towels still soaking wet from the floors the night before. Dawn brought sunshine and I bounced out of bed with renewed energy. Oh yes, I brought all our rain gear - but that was to scare away the rain. If you're not prepared, you're guaranteed to get screwed. And this time it worked. That and listening to Rihanna's "Umbrella" over and over again to scare away the rain. The clouds drifted by our island all day making me nervous, but at ceremony time, the weather was lovely and the sky was clear. Their beach ceremony was gorgeous and we only had a little bit of drizzle for a short period when they were sitting down under the covered porch for dinner anyway, so it didn't hurt the party. 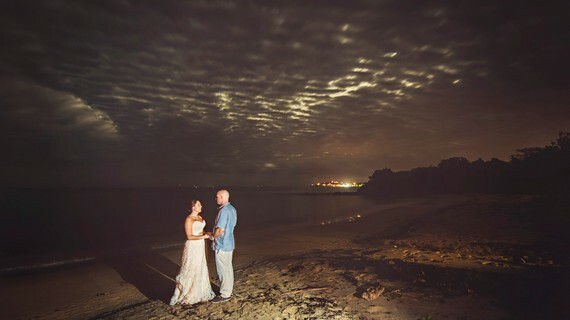 I love this amazing picture of bride and groom Stacy and Darwin on the beach after dinner - this sky tells the whole story. It's hard to believe it wasn't raining. Seems Mother Nature finally received my desperate requests. I'm guessing she had a backup of email from other panicked Caribbean wedding planners and just missed my message about Jacquie's wedding. She got it for Stacy and Darwin's wedding, thank God!!! They were such a wonderful couple too and they deserved beautiful weather after their soaked beach party. What's the moral of the story? Rain doesn't ruin your wedding day if you have a "Plan B." No, you might not have the exact wedding that you planned and you may have to be flexible and adjust your expectations, but only you can ruin your wedding day, not the weather. My brides and grooms (both couples) never let their guests see them sweat. They never whined. They didn't complain (except gently, in private, to me - and they were entitled!). Because both couples kept smiling, so did their guests. Granted, Stacy and Darwin lucked out with the wedding day after a horrifically wet beach party, but I think that was good karma for their great attitudes the day before at the beach. Keep smiling and your guests will keep smiling with you. At the end of the day, you're married and you'll have a fabulous wedding day as long as you've got that "Plan B" ready to roll if you need it.